According to the United States Department of Agriculture website, homeowners select birch trees as ornamental species for different reasons. The bark of many kinds of birch trees is distinctive, coming in a variety of colors and textures that make the tree unique. The slender form of most birches appeals to landscapers. Birches are common in many parts of Canada and throughout much of the United States. The paper birch, also called a canoe birch or white birch, is among the most desirable of ornamental trees. 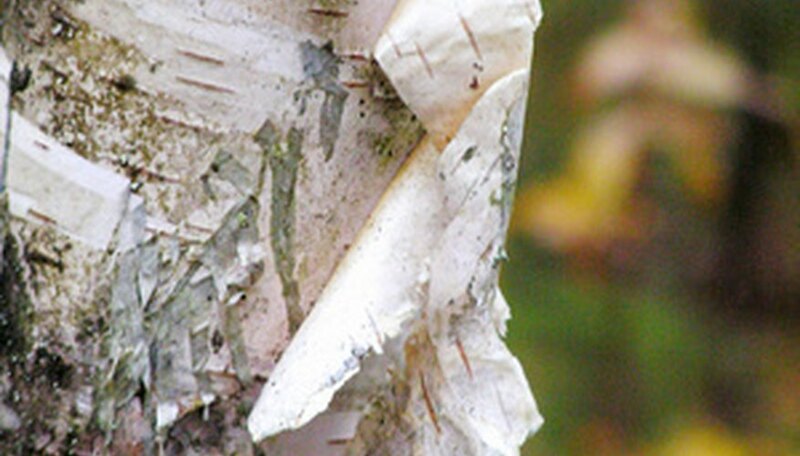 The paper birch features white bark that will peel in strips on the older specimens, which can contrast greatly when the tree grows in front of evergreens, for example. Paper birch averages between 50 and 70 feet high and has dark green leaves; 3 inches of the leaves change to yellow in the fall. Paper birch is native to most of the far north in North America, from Alaska through Canada and into many of the northern states, so it is cold hardy. This species does not tolerate warm temperatures well, and in places where the summers are too hot, the tree will not thrive. Paper birch will grow in the full sun or in a partial-shade environment. The tree needs water when conditions are dry, since it possesses a very shallow system of roots. Paper birch grow quickly when young. An insect known as the bronze birch borer can extensively damage paper birches when the bugs infest the trees. Yellow birch (Betula alleghaniensis) has a pyramid shape as a young tree, then develops into a more rounded one as the tree grows and ages. Yellow birch grows in the Northeast and in southern regions of eastern Canada. Yellow birch has leaves similar to paper birch, but they are a bit narrower and slightly longer. The bark of yellow birch has a yellow-to-bronze hue to it and it will peel and then curl into narrow strips. This feature makes yellow birch a preferred ornamental, along with the fact that it provides light shade but still allows plants to grow beneath it. Yellow birch is another cooler climate species that does best where the summers are not scorching. Plant a yellow birch in full sun and cool, damp ground. The tree has a greater resistance to a pest known as the birch leafminer, a bug that strips away the foliage on many types of birch trees. Another birch tree native to the U.S. is the river birch, a tree that can grow to 80 feet. River birches flourish along streams, rivers and near wetlands, making this tree a good choice if you have damp ground or a pond that needs highlighting. The bark of river birch has superb coloration, with a salmon-shaded exterior and tans and cream colors existing in the underlying layers that show up as the outer bark peels. The gray birch has attractive, chalky bark that does not peel. The gray birch attains heights of 30 feet and grows native to the northeastern states. The whitespire birch has bark that will not peel, but is white. This birch holds up better in warmer climates than the white birch, and is an option for some southern states as an ornamental. A birch called the crimson frost birch has whitish bark with reddish tints. This cultivar also has red leaves and can grow in clay soils.